In the next few months in the run up to our Moral Maze-style panel event The Parish: Has it Had its Day? on 9th October, we’ll be offering extracts, comment and interviews from some of the participants who’ll be joining us at the event. 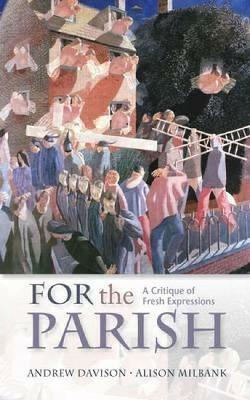 Today, we give you an extract from For The Parish: A Critique of Fresh Expressions written by Revd Dr Alison Milbank and Dr Andrew Davison. Alison Milbank, who is an Associate Professor at the University of Nottingham and Priest Vicar of Southwell Minster, will be one of the ‘expert witnesses’ cross-examined by a panel of luminaries during the evening on 9th October. In For the Parish the authors argue for the vitality of the parish – both for mission and for discipleship – and against the Fresh Expressions and Emerging Church movements. Here’s a brief extract. “Nobody contests that the Church expresses her beliefs in words. We need to appreciate that her beliefs are also to be found in her disciplines and the ways in which she orders her common life. Our practices are not so much window dressing. They are the arena in which our convictions are learned and held. It is precisely these disciplines and forms of life that are being re-written in Mission-shaped Church and re-invented in Fresh Expressions. The practical changes that Mission-shaped Church invites are not at all minor. There is a far greater contrast between the inherited church and Fresh Expressions than might appear at sight. The Fresh Expressions theorists reassure us that we are dealing with changes only at the level of ‘style’. They protest that their movement is no siege upon Anglican belief or identity, that they are concerned merely with changes in outward forms. We reply that there is nothing ‘mere’ about outward forms. These writers do not appreciate just how much the Faith is embodied in those forms, just as it is also embodied in the words of our theology. Those who follow Mission-shaped Church are turning their back on traditional ‘ways of being Church’. This is to turn one’s back on the theology and identity that those forms of life embody. A change in our practical forms of life means a change in the theology that goes along with it. We offer some practical examples. Until now, the average Fresh Expression has had little or nothing to do with its parish, deanery or diocese. This stands in contrast to the average parish in the ‘inherited church’. A Christian who makes her home in the Fresh Expression will find that her week-by-week experience expresses a very different doctrine of the Church and its interrelations than if she belonged to a parish church. As another example, the inherited church embodies the Anglican vision that wherever someone lives, he or she already has as place in the Christian community. Everyone lives in a parish; they are always already members. Our fellow Christians are our family. Just like our biological family, we do not choose them. In contrast, the Fresh Expressions movement sets out a very different vision in its practical forms. The emphasis is on choosing the ‘expression’ of Church that suits you. Consequently, a very different set of values looms large, centred around freedom and choice. The same contrast could be made over the way in which the community worships: is there a liturgy, which is received as a ‘given’, or is the emphasis on ‘devising’ worship differently from week to week? As a final example, consider what the contrasting forms of life of the parish and the Fresh Expressions say about their attitude towards time and space. Do they celebrate novelty or presence? Is the network central, or is place? What is more real, the virtual or the concrete? Those who separate form and content usually do not appreciate the significance of form. When form is treated as separate from content, it is rendered marginal. If we do not appreciate just how much theology comes wrapped up in practices then we will treat those practices lightly and not fully appreciate their usefulness. This is exactly what we see with Fresh Expressions. By and large, the people who write this literature do not appreciate how much the practices of the inherited church offer for mission and discipleship. They discount the forms of the inherited church without appreciating their potency for bringing the Faith to bear upon our time and space. They neglect the potential of these ways of worship and forms of relation to reorder our lives. To throw over the practices of the inherited church is both to weaken our grasp of the Faith, and also to weaken its grasp on us. It is also to neglect opportunities for mission. The traditions of the inherited church are living parables for the Faith and have great potential for witness. We take these ideas up in Chapter 8. The Parish: Has it Had its Day?, a moral maze-style panel event co-hosted by SCM Press and our friends at Church Times is on 9th October at 7pm. Main panellists include Graham Tomlin and Paula Gooder, with a panel of expert witnesses including Alison Milbank and parish priest and author Andrew Rumsey. You can buy tickets and find out more information, on the Church House Bookshop website.